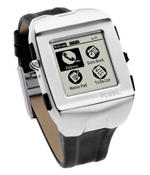 Buy a smart watch online! Smartwatches, or smart watches depending on who you ask, are a form of wristwatch that offers functionality beyond timekeeping. Early smart watch functionality beyond timekeeping has changed dramatically since the first smart watch was created in the 1940s. Back then, additional functionality included digital displays, calculators and basic games. Smart watches that have come out over the past few years are more wearable computers than anything else. As technology advances and we are able to make smaller, cheaper and faster computer parts, motherboards and processing chips, we will see smart watches emerge into extensions, or remote controls, of our smartphones. In addition, this will allow for sleeker and more fashion-centered designs to be created. 1941 – Mimo Loga is introduced as the first smart watch. 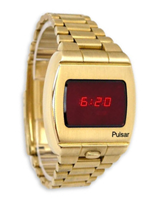 It was considered smart because it offered enhanced functionality above telling time in the form of making calculations using the hour and minute hands. 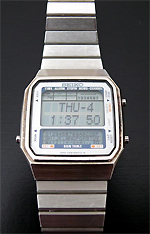 1979 – Intel’s Microma model released with liquid crystal display which was what made it a smartwatch, although that’s questionable.